The Daily April N Ava: 5 Tips To Adjust To SAHM Life! 5 Tips To Adjust To SAHM Life! I was scrolling through Instagram and I came across a meme that said "I'm a mother. My hobbies include neglecting my hair, repeating myself over and over, daydreaming about bed time, constantly picking up my couch cushions from the floor, and never peeing by myself." It stuck out to me because for a long time, I was the woman it described. Not having a designated place to go everyday anymore, I had completely neglected myself. I stayed home almost daily, wasn't doing my hair, wasn't exercising, and my hobbies were on the back burner. After a while, I began to feel a little crummy and I knew something had to change. I was a fun person before I had a baby so why was I not that way after having a baby? 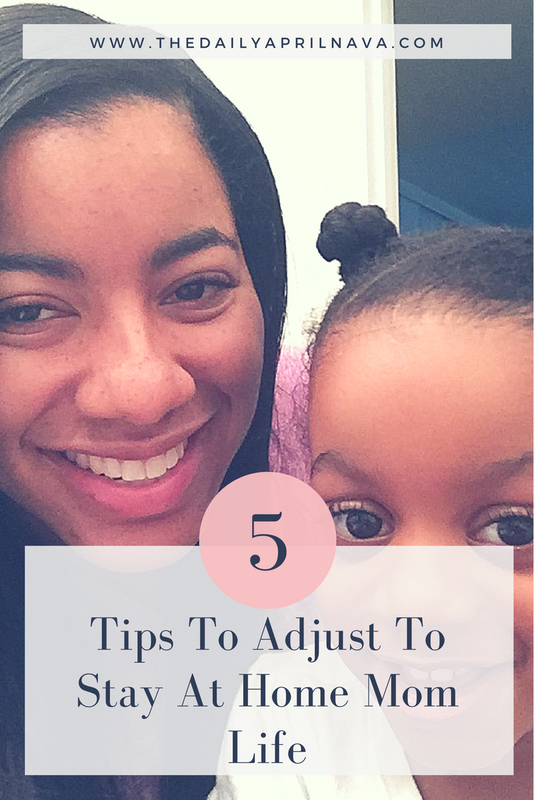 Becoming a mom and being a stay at home mom is an adjustment so I would like to give you some tips to make the adjustment a little easier! I can't stress how much this has helped me. I actually met a lot of my mom friends through Facebook, mainly mom groups. Almost like I was looking for a date lol. "Hey girl, I saw that you live near me and we have kiddies that are around the same age. We should get together sometime." And there you have it, your first mom friend! Ava did not spend the night away from me until she was about 19 months old. What the heck was I thinking?! My parents have always been gladly willing to keep Ava, I guess I was just the nervous first time mom. We all need time to regroup and a little time alone will definitely refresh your mind. I'm sure you used to do fun things before having a child/children, so why not enjoy those things again? I personally love going to festivals, hiking, going to vegan meetups, blogging, and reading. I am currently reading The Secret by Rhonda Byrne. Keep up with your beauty routine. This one was hard for me. I felt bad for "wasting money" getting my hair done or buying a new bottle of nail polish. But if getting your hair done makes you feel amazing, then do it! My personal feel good habits are going to the hair salon, freshly painted hands and feet, and beautifully scented perfume. Get out of the house with your children! Stay at home moms shouldn't actually stay at home! I can't tell you how many times I've heard a mom say "it's too hot to go outside", "it's too cold to go outside", " the kids are driving me crazy so we are staying in." The kids are driving you crazy because they need to be outside! Go to the park, let the kids burn off some energy and get some fresh air. They will have a good lunch, take a nice long nap, and you can get a little bit done around the house or even take a nap yourself. I really want to encourage moms to enjoy being home with their babies but not forget about themselves in the process. I wish I had read something like this a few years ago. I hope you find these tips helpful. Let me know in the comments some things that make you smile! Until next time. The need for #SelfCare is no joke. Your mental health, as mom, increases the happiness of all! If mom isn't happy, no one is happy. These are great tips! I find that keeping up with my beauty routine is one of the most important for me. It's so easy to wake up and throw on sweatpants, no makeup, hair up, etc., but then I don't feel like myself. I try to make time to primp a little most days so I feel more human! Great tips for new sahms to take care and not get lost. It's a great life but can be tough to remember ourselves! The " I am a Mother" quote is soooo sooo true! I can't pee by self at allll and I I'm always picking up the pillows on the couch! I get out and take a break from my kids every weekend but it's while GROCERY SHOPPING ! But u got to get it whenever and wherever u can ! Thanks for sharing these tips! I will definitely keep them in mind for when I become a mom! Great tips! It took be until my twins were a year old to start organising time away from them and it's amazing! I've been both a stay at home mom and a working mom. They are both equally difficult but I'd say being a stay at home mom and NEVER getting a second to yourself can really be so much more taxing than working. Mom friends are a must!!! I wouldn't be able to do anything else with out them, they help get me out of the house, to take care of myself better, and sometimes the reason I put make up on!!! ditto on enjoying your hobbies!! even if you dont have a lot of time for them, make time! This is all so true! I became a SAHM about 2 months ago & I needed this! Keeping up a consistent beauty routine is SO important! You gotta feel good about yourself. Mumma friends are a must!! I always worry about my future as a SAHM because I keep thinking I'll be bored. I need to keep these tips in mind for then!! I agree with all of these-especially keeping up with your beauty routine. its not just about appearance, it's self care! Yes, yes, yes. Listen to these wise words mamas! You are every bit as important as your children and you'll be better moms for it. Being away from the kids even for a few hours is like gaining sanity back, lol. A me-time is certainly a must for moms. Planning to Rock the New Year! Tis the Season for JORD Watches!